John Cages Thirteen Harmonies, for violin and keyboard (1985) is from the CD; Melodies & Harmonies, recorded September 29-30, 2009, Amann Studios, Vienna. The Thirteen Harmonies is a selction of 13 out of a total of 44 Harmonies from Apartment House 1776. Roger Zahab made the selection and created a version for violin and keyboard. 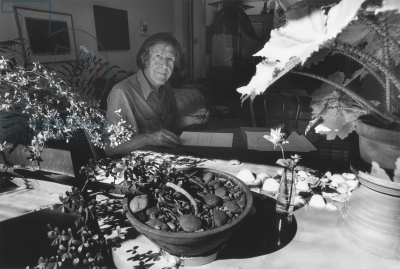 John Cage, New York City, 1985. Photo by Chris Felver.